Sacred Music often has fantastic tributes, written when a great Church musician dies. The following is a tribute to Monsignor Francis P. Schmitt (“Frank Schmitt” to his friends) written by a famous musicologist, composer, teacher, and organist named Allen Hobbs. It appeared in Sacred Music, Volume 122, Number 2, Summer 1995 under the title “In Memoriam: Monsignor Francis P. Schmitt (1916-1994).” My comments appear in red. HURCH MUSICIANS in general and Roman Catholic church musicians in particular have lost one of their most dedicated spokesmen. Monsignor Francis Schmitt died suddenly at 2:15 A.M., Monday, May 2, 1994, in an Omaha hospital. Although he had not been in the best of health, his death was a shock to all his friends. The first concert by the choir took place in 1942. [ It is so cool that people still made time for music, even in the middle of the Second World War! ] As the groups grew in size, they also grew in vocal technique, and the repertoire grew quickly. Within a few short years the Boys Town Choir made increasingly frequent tours, and their concerts “at home” were performed before a standing-room only audience in Dowd Memorial chapel and later in the auditorium of the music building. Monsignor Nicholas Wegner was appointed to replace Father Flanagan, whose shoes were hard to fill. Father Schmitt had the utmost respect for Monsignor Wegner, a wonderful administrator and as director of Boys Town, a great source of support for Father Schmitt’s music program. He made Father Schmitt assistant director of Boys Town. By that time there were numerous activities for boys who couldn’t sing. An excellent band, private music lessons, and an excellent music library enhanced the program. Later on the music building was constructed, providing rehearsal and practice facilities and an excellent auditorium. The annual Liturgical Music Workshops were the invention of Father Schmitt. The earliest workshops were designed primarily for church musicians of the Archdiocese of Omaha, but the quality of the workshops was so outstanding that within a few years there was an international faculty and students from all over the U.S.A. and Canada. Among the faculty one remembers the names of Flor Peeters, Anton Heiler, Jean Langlais, Roger Wagner, Paul Salamunovich, Louise Cuyler, Monsignor Richard Schuler, Paul Manz, Dom Ermin Vitry and many others. The complete list reads like a Who’s Who in Liturgical Music. Father Schmitt and Frank “Moe” Szynskie taught boys’ choir techniques. Besides the faculty, there were other reasons for the success and popularity of the workshops: 1) the central location, for Boys Town, situated just outside Omaha, is almost exactly in the center of the United States, a location far preferable to either of the coasts; 2) the low cost, for Father Schmitt allocated a certain portion of the profits from the Boys Town Choir tours towards the expenses of the workshop; and 3) the housing was “on campus,” with a great deal of space available because many of the older boys were on vacation at the time, either at a farm or a summer camp. The program for the next year’s workshop was generally well-known in advance, and church musicians could plan accordingly. There was a rotation system for some of the faculty, including the organists. Flor Peeters and Jean Langlais usually alternated years. [ Yes, I know people who went to Boys Town to work with Peeters and/or Wagner. ] There were private lessons at minimal additional cost and masterclasses. Roger Wagner arrived each year (with perhaps a few exceptions) to direct a large choral work. The choir, made up largely of music teachers and professionals could easily prepare a large choral work in two weeks. Paul Salamunovich usually took the first week’s rehearsals and Roger Wagner arrived for the second week. In 1959, Father Schmitt was named a papal chamberlain by Pope John XXIII, with the title of Monsignor. In 1966, he was elevated by Pope Paul VI to the rank of domestic prelate. He was still called “Father” Schmitt. But it was too late in most places to “implement” anything. The guitars had already entered the churches, and some of the guitarists had even learned how to tune their guitars. New music had already been set in motion. There were three or four chords: the tonic, the sub-dominant, the dominant seventh and occasionally the dominant without the seventh. There were two basic rhythms: 3/4 waltz and 4/4 ballad. Occasionally there was the alla breve polka, but the polka people didn’t know it was alla breve. Matters got worse, not better. English translations changed almost as quickly as they were published, and many Catholic publishers went broke. Vatican II provided for some allowances but at no time did any council document even suggest that musicians and/or congregations should be made to suffer. Matters were supposed to improve, with decisions left to the “competent territorial authority.” Father Schmitt and I discussed this at length on one occasion. The problem was that “competent” musicians and liturgists were almost never in the position of authority, and the “territorial authorities” were very seldom competent. In other words, what was too often heard from the competent specialist was one of the following: “...but I have no authority;” or (from the territorial authority) “...I don’t know anything about music so form your own committee and I will approve what you ask for.” The result was, of course, utter chaos. [ Allen Hobbs is at fault here: he ought to have said what he would have done differently. He ought to have mentioned some positive way things might have been improved. ] Whereas Gregorian chant was to maintain “pride of place” and sacred polyphony was to be retained as “a treasure of inestimable value,” both were thrown by the wayside. Whereas the pipe organ was to continue to be the “traditional instrument” of the Latin Church and “other instruments may also be admitted into divine worship” (note the word may), the cart is now before the horse even today, as it was in 1965. “...the use of the Latin language is to be preserved in the Latin rites…”, “...the use of the vernacular may often be of great advantage to the people.” These and numerous other excerpts from the instruction on sacred music have been abused. Father Schmitt and the others on that particular commission were helpless to reverse what had already started. The horse was already out of the barn. Monsignor Wegner retired in 1973, and the drama of Boys Town took place in 1974. [ There was some kind of “money scandal.” ] Father Schmitt said little about it in public, but I remember all too well an evening he spent in my living room when he discussed the whole matter at great length. His parting words that evening were “this is just a bad year.” He was right: his mother died in early December, 1974. From 1975 through most of 1977, Father Schmitt took another sabbatical. He lived in his quarters at Boys Town when he had to, but he spent most of his time traveling and writing a wonderful book, “Church Music Transgressed.” [ I read this book many years ago. It is incredibly depressing, and consists of a lot of “inside information.” ] Frank Szynskie, better known as “Moe,” succeeded Father Schmitt as director of the Boys Town Choir. They had worked together since Moe arrived at Boys Town in 1941 (shortly before Father Schmitt). Moe was a wonderful singer, and eventually became Father Schmitt’s right hand-man. In re-reading a number of letters from Faher Schmitt before going to work on this article, I came across several with references to Moe: “The first and best of my wards;” “my chief cook and bottle washer for most of the past fifty years.” Father Schmitt’s old office in the music building at Boys Town always had two autographed photos where he could see them: one of Father Flanagan and one of Moe. There were other pictures too, but those two were the most prominent. They were pictures of those closest to him. “Church Music Transgressed” was a resume of what Father Schmitt actually heard and saw between 1975 and 1977, but it is not confined to those years. It is a thin book but a thorough appraisal of church music since the Council of Trent. [ This statement is . . . not accurate in my view. ] No good church musician should be without it. In 1977, Father Schmitt was named pastor of Saint Aloysius Church in Aloys, Nebraka, ten miles west of West Point where he had been raised. Oh, yes. He had two choirs! He had a small adult choir and a children’s choir. [ I would have liked to have gone there and hear what the music at Mass sounded like. ] In 1989, it was agreed between Father Schmitt, Frank Szynskie, Father Val Peter (presently the executive director of Boys Town) and Ann Labounsky, chair of the department of sacred music at Duquesne University in Pittsburgh, that the huge and invaluble library of the Boys Town Choir should be given a permanent home at Duquesne. There are over 6,000 volumes in the “working library,” plus many rare books, some of which belonged to Father Schmitt’s mother whose cousin, Father Joseph Pierron, was a pupil of the great Dr. Peter Wagner, one of the most import authorities on Gregorian chant. [ Ah! There’s the Peter Wagner connection! ] Indeed, it was Father Schmitt who continually proclaimed the great importance of Dr. Wagner’s scholarship, and now Dr. Wagner’s work is generally recognized as the scholarly work of a real pioneer, more than 60 years after his death. [ This statement is erroneous. Dr. Peter Wagner was always revered and respected. ] Father Schmitt took part in the functions at Duquesne after the library had been moved there, thanks mainly to Moe and some of the choir boys who did all the sorting and packing. In his little parish—between 60 and 70 families—Father Schmitt was always at work. He helped out at Saint Mary’s Church in West Point and was a member of the Catholic school board. Father Schmitt rarely spoke about himself. I find a letter, typical of Father’s letters, dating from December, 1990: “I trust that your eye operation was successful. Mine have been pretty good, 'tho I had some muscular degeneration a couple of years ago. Hearing not bad either, 'tho after tests I invested in a hearing aid which I use only in the confessional, afraid some chap might come in and say that he had killed someone and I would tell him to keep up the good work. [ This is very funny! Schmitt was said to possess great wit. ] Last week, I tried to back out of the garage without opening the door, and that, I fear, is not a physical problem.” His humor was legendary in his own time. In 1991, Father observed the 50th anniversary of his ordination. I told him I would write something for the occasion but he would have to choose the text and tell me something about the abilities of his choir. He chose Jesu dulcis memoria, and specified “in Latin!” He added “we had that inscribed on our St. Caecilia medal.” I was pleased that my composition was within the grasp of his choirs, and one verse was for his little children’s choir. The same year marked the 100th anniversary of the parish, and he down-played his own anniversary in favor of the parish’s celebration. Father Schmitt told very few people that he had cancer, and he went for a chemotherapy treatment. On April 29, he had a fever and called Father Gary Ostrander, pastor of St. Mary’s Church and asked if they could take his Sunday Mass. The doctor wanted him in the hospital for observation, and Father Schmitt had his niece take him into Omaha. Moe saw him Sunday, and although he was concerned about Father Schmitt’s condition, he had no idea the end was so close. Father went into coma and died at about 2:15 A.M. on Monday morning. There was a wake in the chapel at Boys Town on Tuesday, and another at St. Aloysius on Wednesday. The funeral Mass took place at St. Mary’s Church in West Point on Thursday, May 5. The principal celebrant was the Most Reverend Elden F. Curtiss, Archbishop of Omaha, with about one hundred priest concelebrating. Alumni from Boys Town came from near and far. He was buried in the family ploy in St. Michael’s Cemetery, West Point, with Archbishop Daniel Sheehan, retired Archbishop of Omaha, conducting the graveside service. At the end, Frank Szynskie directed a choir of men (former “boys” from the touring choir) in one of Father Schmitt’s favorite works, the Salve Regina by Bonaventura Somma. At the wake on Tuesday at Boys Town, they sang both Somma’s piece and Jaeggi’s Salve Mater. A couple of years ago Monsignor was helping us with grade school confessions. I had the second and third graders all ready to go and I told them there would be several priests, including Monsignor Schmitt. Several of the kids got smiles on their faces and blurted out, “Oh! Good.” His line at the confessional was always the longest. Father Schmitt frequently ended a letter or note with “1,000 good wishes.” So we can say “1,000 thanks, Father, for you have taught us so many things. Father Schmitt’s survivors include an older brother, William, of West Point, a niece, Kathy Means of Omaha, his huge Boys Town family, led by Moe and his wife Adelaide, and a family of friends all over the world. He was preceded in death by his parents Mathias and Magdalene Schmitt, his brother Leo (long bed-ridden as a result of an accident), a sister, Mrs. Frances Schrum, and finally his beloved sister, Beata Schmitt, who had cared for her parents, her brother Leo and her sister Frances. Father Schmitt was deeply attached to Beata, who died December 26, 1993, only months before his own death. A memorial scholarship has been established. 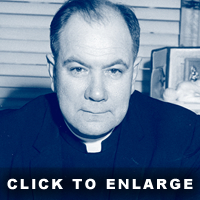 Contributions may be sent to the Monsignor Schmitt Boys Town Alumni Scholarship Fund, P.O. Box 2, Boys Town, NE 68010. It provides scholarship funds for seniors graduating each year from Boys Town. I suggest also that one write to The Seabury Press, 815 Second Avenue, New York, NY 10017, requesting that “Church Music Transgressed” be put back into print. May the Good Lord Whom Monsignor Schmitt served so unselfishly throughout his entire life grant him eternal rest. The Lord giveth; the Lord taketh away: Blessed be the Name of the Lord.